Craig was born in 1956 and raised on the Hamilton Mountain. As a graduate of Hill Park High School and McMaster University, he is passionate about the Hamilton community and owns and operates a real estate brokerage, Realty Network: 100 Inc., which serves Hamilton, Burlington and the surrounding area. A devoted family man, he relishes in family time with his Lady, Myriam, and his two sons Brendan and Brock. Brendan and his wife Allison have two young sons, Atlas and Archer, and are currently living in the Calgary area. While living in Dundas for over twenty years and raising his children, Craig has been long time member of St. James Church. Other than Masonry, Craig’s interests include water sports, fishing, motorcycles, snowmobiles, and classic cars. He also loves to barbecue, which is the extent of his cooking skills! Craig was initiated into Valley Lodge No. 100 in 1984, and was Master in 1991. 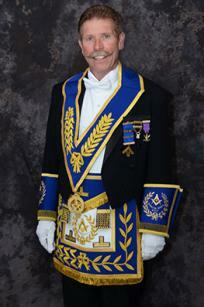 He is a 32nd Degree member of The Scottish Rite where he joined in 1985. Craig is proud to have a long and rich family history in Freemasonry; his oldest Son, Brendan, is a Past Master of Valley Lodge, his Mother was a member of The Eastern Star, his Father was a member of Buchanan Lodge in Hamilton, his Uncle was a member of St. Andrews Lodge in St. Catharines as well as being a 32nd Degree member of The Scottish Rite, his Grandfather was a member of Hugh Murray Lodge in Hamilton., and is Great Grandfather was a Lodge member back in Ireland.